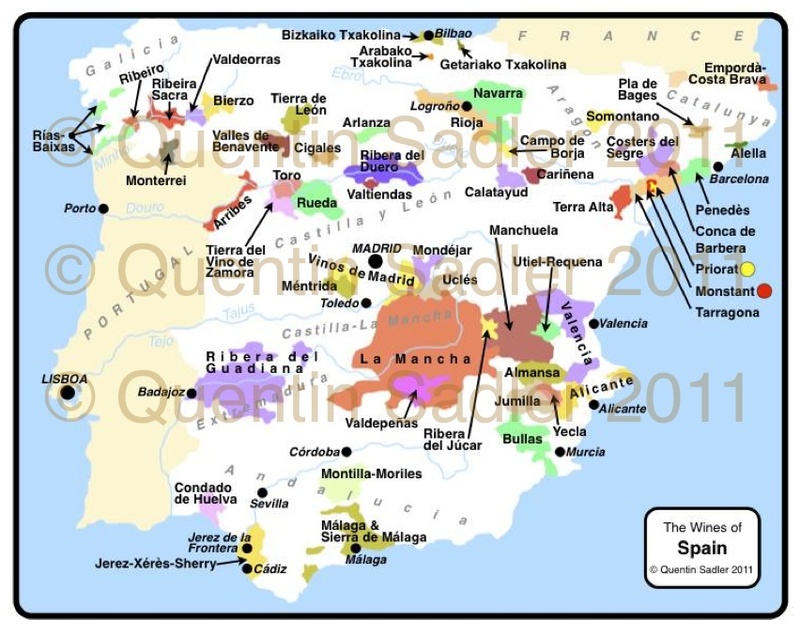 Map of the wine regions of Spain – click for a larger view. High-res non-watermarked versions of my maps are available by agreement. My tasting was of Spain without Rioja, so we had no examples from Bodegas Bilbainas, the long established producer that Codorníu purchased some 10 years ago and whose Viña Pomal wines get better and better – try the 2005 Viña Pomal Reserva, it is very elegant with rich fruit with a wonderful savoury elegance, smooth tannins and a bite of fresh acidity giving structure, it is great value for money and very food friendly. No, I left Rioja for another time and concentrated on three other great Spanish regions and wineries. Firstly the always exciting and reliable Raimat from Costers del Segre on the Catalan Aragon border, about as inland as you can get in Catalunya. If you have ever been near Lerida – Lleida in Catalan – you know where this is and you should visit Lerida as it is home to some wonderful restaurants and tapas bars. The Raimat Estate is one of the marvels of our time. Yes, there is a castle here and yes wine was made here hundreds of years ago, but when the Raventos family, who own Codorníu, bought it in 1914 it was the sort of parched scrubland you drive through quite often in Spain. However, they had a vision to make really good wine here and set about making this goal a reality. Along the way they imported into Spain and started many elements of modern winemaking that we now take for granted. The first problem was the soil, it was very saline so they had to bring it back to a workable condition. They did this by first planting alfalfa grass and then 35 million pine trees which apparently desalinated the soil, they let the trees mature and then ripped them out and were ready to start producing great wines by around 1974, a mere 60 years after they started! I love this story, it speaks of such dedication or determination in the face of any reality, imagine a company thinking that long term today – still it paid off in the end. Actually I expect the time lag helped things in the long run as by the time they had finished Codorníu was enjoying a relationship with Davis Wine School at the University of California. Their technical knowhow and experience of grape growing in hot dry conditions was a boon and as a consequence Raimat was one of the very first places outside of California to have state of the art irrigation and selection of rootstocks for their soils and vines. This ‘new world’ approach also led to them planting a wide array of international grapes – as well as Spain’s Tempranillo and some displaced Albariño that they put to very good use. Even the way the grapes were planted was alien to Spain, it was an early example of vines being densely planted on a trellis system, just as you see now all around the world, but still relatively rare in Iberia. Since 1988 the region has enjoyed Denominación de Origen status and there are other good quality producers here, but Raimat remain the driving force. 60% Chardonnay with 40% Pinot Noir made in the traditional method. I really was impressed by this wine, it had a roundness and a creamy weight to it together with some citrus and apricot zing and little flourishes of deeper dried raspberry-like fruit. This is a very fine sparkling and wowed this audience – 89/100 points. £14.95 per bottle from Grape Expectations in Andover. 50% Chardonnay fattens up and rounds out the underrated Xarel·lo (the break and the point in the name by the way mean that you pronounce it with 2 L sounds, otherwise a double L in Spain sounds like a Y), one of the traditional Cava grapes. I enjoyed this wine, it was fresh and lively with supple peach and apricot characters, some minerality and zesty grapefruit and ripe apples together with a beguiling touch of exotic mango fruit too. It is partially barrel-fermented and this shows in just a kiss of smoky, toasty complexity good medium weight dry white wine – 87/100 points. £9.99 per bottle from Noel Young Wine in Cambridge. Although Tempranillo is the junior partner here it still tastes very Spanish and is a hugely enjoyable wine that is full of rich plum and touches of dried fruit too. There are spices and coffe notes and a hint of leather showing it is developing nicely – a lot of wine for the money – 87/100 points. £7.49 per bottle from Winerack stores in the wider London (UK) area. As well as Raimat the Codorníu group have a wonderful winery in the Ribera del Duero region of Castilla y León. It is called Legaris and shows why – in my opinion – Ribera del Duero should be the next Spanish region to be promoted and join Rioja and Catalunya’s Priorat as a Denominación de Origen Calificada / DOCa, Denominació d’Origen Qualificada / DOQ in Catalan, rumours abound, but so far it has remained a more lowly D.O.C. – watch this space. However as Ribera del Duero is a red wine region they look to nearby Rueda to produce a white wine, I love Rueda wines and wish they were more popular as they never let the consumer down, some are better than others, but they are always goo – a handful are superb and among the very best white wines from Spain. Viura is widely used, as is Sauvignon Blanc, but the star is the indigenous Verdejo grape – think of a fleshier weightier Sauvignon Blanc and you get the idea. Everything about this wine screams freshness and zing, which is enhanced by the 7% Sauvignon Blanc, the Stelvin Lux screwcap and the absence of any oak – you can use oak on Verdejo, but like most people I favour the fresher approach. The fruit here is beautifully ripe which gives the merest hint of creaminess to the palate to balance the zesty qualities, there are herb and grassy nuances too leading to a long finish. The body is given more depth and roundness by a touch of skin contact during the winemaking, so leaving the merest trace of tannin across the tongue. This is one of the 3 best Ruedas I have ever tasted, do yourselves a favour and make this your house white over Christmas, or the Summer, or … – 90/100 points. Generally around £9.99, but £7.99 per bottle from Noel Young Wine in Cambridge and also available from The Market Square in East Grinstead. Ribera del Duero is a red wine region and this shows why. It is 100% Tinto Fino ( a local clone of Tempranillo) aged for 12 months in a mixture of French and American oak and it is a very elegant wine. Rich, yes, fruity, yes, smooth yes, but there are lovely fine grain tannins, cocoa and coffee complexity and a touch of fresh, balancing acidity. Everything about this shows that it will develop beautifully over a few more years – 90/100 points. £15.50 per bottle from Hercules Wine Warehouses in Sandwich & Faversham, Kent. I was also able to try the 2005 Legaris Reserva recently and that really is a magnificent wine, concentrated, supple and elegant – if you want to see what makes Ribera del Duero tick, then give it a go – 91/100 points. If you have not experienced a wine from this tiny, but stunning region, then do grab the chance. 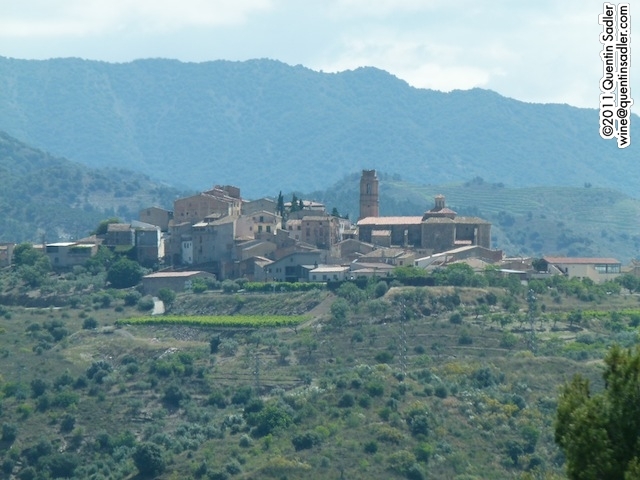 Priorat produces Grenache based wines that are unlike the rest of Spain – actually as the grape comes from Spain, so it should be called Garnacha, or even Garnatxa when in Catalunya. 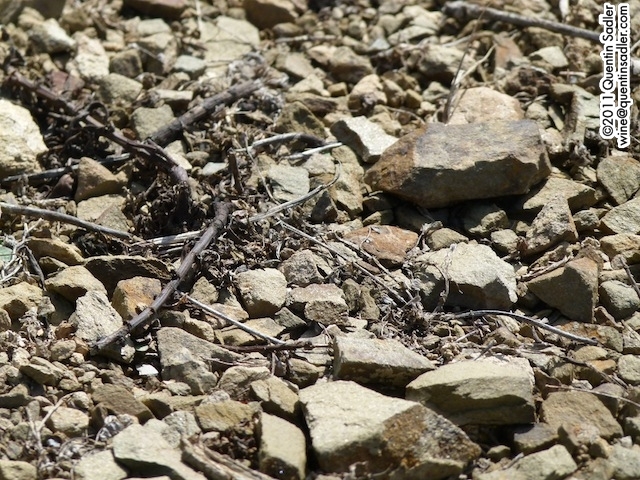 Really it is the soils that do the work here, the dry licorella– decayed slate or schist – contains almost no organic matter or anything of goodness to the vine. This forces it to work hard, putting down deep root systems and so producing tiny crops of deeply concentrated fruit. Natural alcohol levels of around 16% are perfectly normal here too – and I have seen higher! Scala Dei is the oldest winery here and something of a legend in the wine world, it it was founded in the 12th century along with the Scala Dei monastery – the area is named Priorat after the the Prior who headed up this Carthusian monastery in the village of Scala Dei, which means Ladder to Heaven. Do not be put off by the words Vi Negre on the label, that is merely Catalan for red wine! The baby of the range and completely unoaked, this is a joyous drink. Pure Grenache with lovely floral aromas, smooth tannins and a chunky, sometimes rustic feel that would make it perfect with an array of hearty dishes. There is even a hint of dried and cooked fruit as well as spice, herbs and minerals on a long finish. This was much appreciated by my tasters – 89/100 points. If the Negre was good, it was a mere overture ( a great one though) for this. What a wine, aromatic, floral and rich, full-bodied and supple, but not gloopy. Everything is in balance, smooth tannins, dense blue-black fruit, spice and coffee notes as well as a rich earthy feel and an epic of a finish – 92/100 points. £18.49 per bottle from Winerack stores in the wider London (UK) area. I was also able to try the 2006 Scala Dei Cartoxia Reserva recently and it was astonishing. I was a judge the other week at the West London Wine School Wine Awards 2011 and this wine won the Iconic Red Wine Award – 94/100 points. So, there you are a line up of wonderful wines, all very different, so giving something for everyone. Looking at the list above I think I now know what I am going to drink this Christmas. Thanks for the pedantry! Not quite sure what point you are making, but Happy New Year anyway!